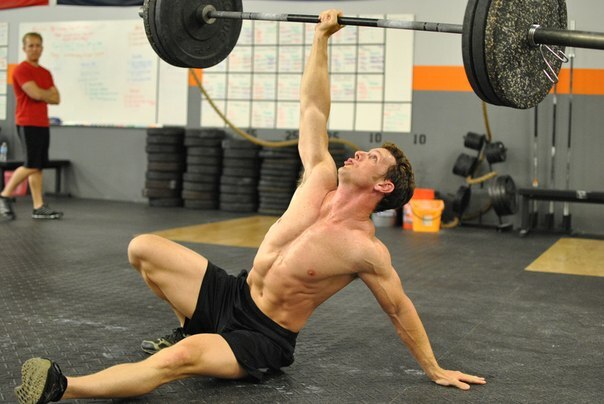 In the world of crossfit – athletes are constantly striving to shock their body with new positions. They also combine unusual exercise regimens or non-standard workouts of muscle groups. After all, the main goal of an athlete in crossfit is to develop a functional force that will be useful in everyday life. That is why the rope exercises became very popular. It is important to understand that not a simple rope is used, but a special sports rope with weights hanging at the end. This greatly increases the load on the target muscle groups. with problems in the abdominal area. 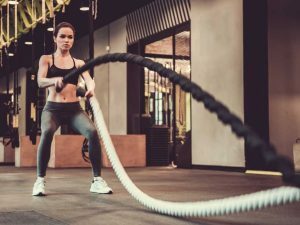 And most importantly – exercises with a rope are not advised for people who have problems with the cardiovascular system. Note: on the other hand, people with a high degree of fitness don’t need to worry, because with a good vascular system, the pulse will reach the intensity of fat burning. And this means that the entire system is good to use for weight loss, without injuring the muscles. Why, in crossfit, and in other speed-strength sports more and more exercises with ropes for hands are gaining popularity. There are several explanations for this. First, the dynamic load. When performing classical exercises with a barbell or dumbbells, the hands work in a dynamic phase. That is, they rest and are loaded. When working with a rope, the effect of a micro-superset appears. When in one phase of the movement exercises with a rope work, for example, biceps, and in the other – triceps. This does not allow the muscles to get rest, making the athlete use other muscles to stabilize them, increasing isometric muscular loads, so that athletes greatly increase their strength endurance. The next moment is the presence of an asymmetry in the loads. 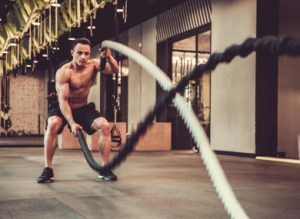 When working with a rope, the muscles are worked at a very unusual angle, which allows you to use the deepest muscle fibers without any problems. Third, there is a low possibility of injury. The main load is regulated by the speed of the exercise, and the maximum complexity is provided not by weight, but by the weakest component of the core and arms. And since the wrists cannot be stronger than the muscles of the back, it is simply impossible to disperse the rope more strongly. In case of an overload, it will simply fly out of their hands. Note: the disconnect of the rope from the hands is is due to a stretch from sudden movement and inertia. 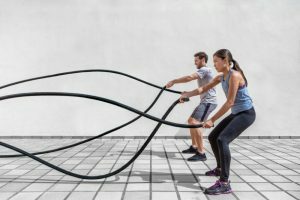 What exercises can you do with a rope? Rotation from side to side Lateral muscles of abdomen. Do not use wrist wraps. The load should be limited by the maximum wrist strength. Work at a moderate speed, increasing the load gradually with the growth of muscle mass. Use basic exercises before working with the rope. Work in tandem with a partner who will monitor your technique. Use the heart rate monitor for the entire set. If the permissible pulse rate is exceeded, stop and take a break. Note: the maximum allowable pulse is calculated according to a simple formula (220-age) * 80%. Upon reaching this pulse rate, the intensity of the exercise should be immediately reduced, since the athlete risks getting micro-traumas of the heart, which will be overgrown with a connective tissue, and thus lead to heart disease. Take two ropes of extremely large thickness (so that it is impossible to close the fingers around the diameter). Get up in the half-squat. Stretch hands out in front, not fully extending them at the elbow joint. Slowly start moving the right hand up, and the left down. Gradually accelerate in the movements. At the end of the rope, make a sharp jerk to compensate for the inertia. Work until the muscles weaken or until the pulse reaches a critical level. This is a complicated version of the last exercise, which requires more concentration. It not only loads the upper shoulder belt, but also the muscles of the abdomen. Get up in a half-squat. Slowly start moving your hands down, and then up. This exercise is somewhat more complicated, but it involves the muscles of the legs at full power. It can even replace the squat. Take the ropes in your hands. Stretch arms out in front, not fully extending them at the elbow joint. After that, jump up sharply. Raise ropes at the same time as high as possible above the head. At the moment of peak inertia, which coincides with the landing, sharply whip the rope down. If the rope does not fly out of your hand, you can repeat. Work up to the top pulse rate, or to a strong weakness of the muscles of the wrist. Take two ropes in hand. Slightly bend the lower back, while generally keeping the back relaxed. Relaxing the lower back, begin to pull the ropes to the waist (by intense movement), while unfolding the body in the direction of movement. At the peak of the load, turn the other way, to achieve the optimum result. The throw of a rope while standing is similar to the double wave. The main difference is the intensity. Instead of working in a semi-squat, you need to work with a jump, while maximally throwing the rope forward (by moving your hands up). The rest is identical. Position yourself in a full squat. Jump up out of the deep squat. At the same time, the wave motions accelerate. Ideally, when one jump is necessary, you don’t need to do more than two cycles of wave movements with the hands. The muscles of the abdomen, the muscles of the upper humeral girdle, back, thoracic and deltoids are worked out. 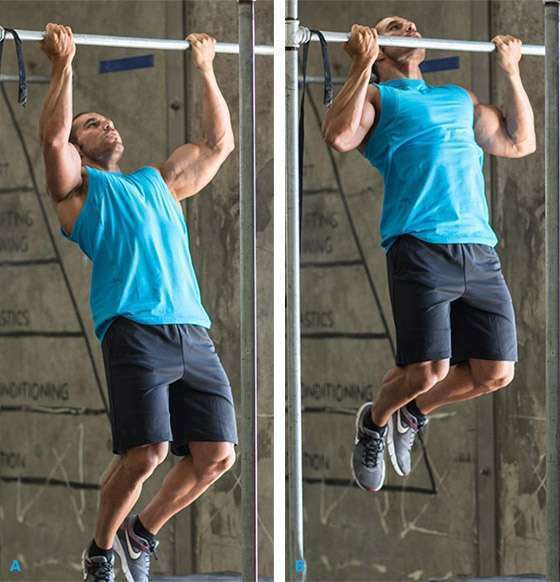 These are the same exercises with a rope as in classic crossfit. The focus is not on the hands, but on correct movements of the body. The exercise is similar to working with twists. The main difference is the isolation of the ab and core muscles, which is achieved by isolating the muscles of the legs and lower back, which eat up the lion’s share of the load. At the peak of the load from the rope, turn around in the opposite direction. This is a very simple exercise, for those who have mastered the side plank. And slowly – turning the body back, pull the rope to yourself. It is important to do this not with the arms (muscles of the biceps), but with the back and the body. After reaching the end of the exercises with a rope, turn around on the other hand and continue the exercise. The main feature is high involvement of rhomboid muscles of the back, and oblique muscles of the abdomen. Movement occurs solely due to the pull of the elbow (not the wrist), which allows you to completely disconnect the shoulders. 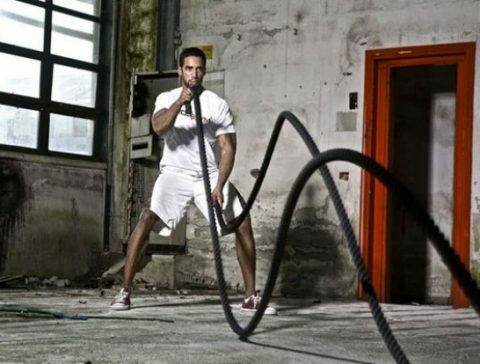 As can be seen from all of the above, exercises with a rope are able to replace almost the entire inventory of the gym. After all, both the muscles of the legs and the press, as well as the muscles of the back and upper shoulder girdle are involved in the work. The ability to constantly increase the load without risking injury makes the exercises most effective for all groups of athletes, both beginners and experienced. Most importantly, the inertia in most exercises, allows you to improve not only strength and endurance, but also build muscle. It is due to the intense elements – the muscles are worked out as deeply as possible (after all, about 80% of the muscle fibers are involved). 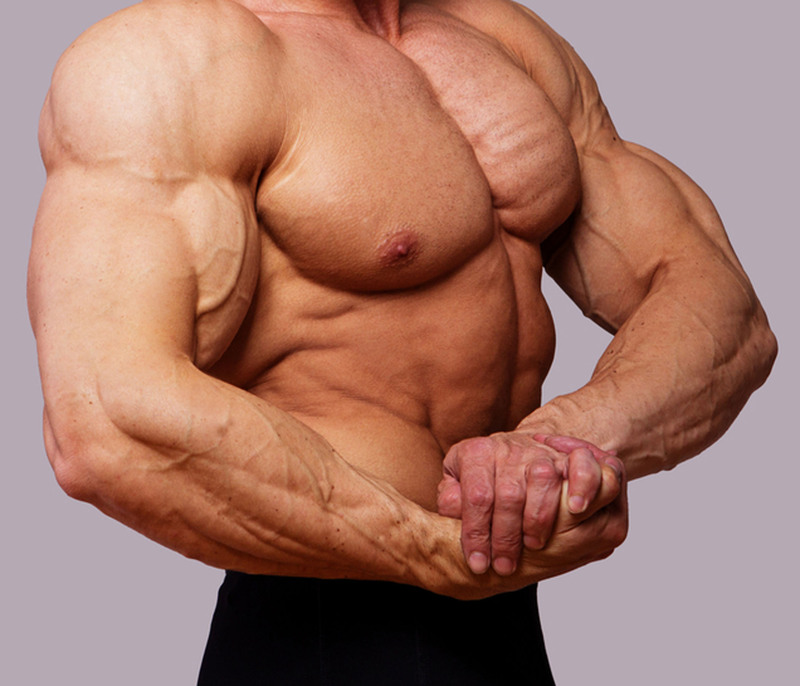 With proper loading, dense muscle mass grows, with a high ability to recover. Therefore, exercises with a rope are highly recommended to those athletes who engage in extreme sports. Working with the rope allows you to increase the impact up to 7 times within two months of training.